Nakhon Pathom is a little bit over 50 kilometers from Bangkok. If you like to come and join me in here, you will see the most Giant stupa in Thailand, Phra Pathom Chedi, the Museum and Sanam Chan palace. Let's eat Thai street food at Giant stupa. 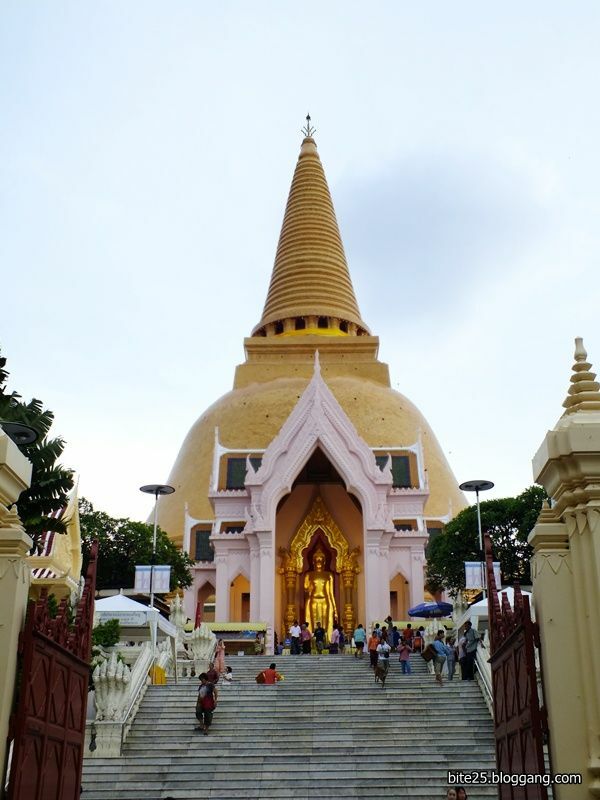 Arrive at Phra Pathom Chedi Temple. Let's see the history of this province, the main faith of Dvaravati culture, the first kingdom in Thailand, Phra Pathom Chedi and the museum. Have a look the local market and have lunch in the local shop. Visit Sanam Chan palace, the palace was built by King Rama VI, here you will see the multi-culture of the building by the way. They become the perfect style. After walking around Sanam Chan Palace, I will take you to relax at a coffee shop around there. Go to Phra Pathom Chedi again. There are lots of local street food shops at evening till night time then we will have dinner there. End of the trip. I will drive you back to BTS Bang Wa. I was born in Nakhon Pathom. Then I really want to show you about my town, which is not far from Bangkok but they have been contained a lot of history and also lots of nice food here. You can bring your hat and sunglasses because it may be quite hot. Do not get dressed too short because we have to go to temple and palace. It was truly an amazing day! Paramapanot was very accommodating as we had to change the start time due to my arrival flight. Also, a complete worry-free experience. She took care of parking, tickets, translations, lunch - everything. The tour itself was very informative. A lot to learn in each of the five temples we visited plus you get to immerse yourself in the culture, which of course is as fascinating as each site. Loved every minute of it! Gift is so knowledgeable about each site that is planned on the tour, she also has great energy and enthusiasm for the job which makes the full day trek very pleasant. Cannot leave bangkok without doing this tour with gift. I really enjoyed the trip. The floating market is an intersting experience and would certainly recommend to y friends. Paramapanot is a lovely person - with good knowledge of the place, habits and tips. She was also ver friendly and patient. Good English too!